A few weeks ago I showed you Dicentra 'Stuart Boothman' and wrongly said it was selected from Dicentra spectabilis. I was very busy at the time and had one of those moments that they tell me is associated with age, even though I seem to have been having them all through my years, when I just grabbed the first name to surface from my memory. As soon as Fred had put the log onto the site and I read it through I immediately realised that I had made a mistake with the name and it should have read Dicentra formosa. I decided to leave it and intended to correct it in last weeks log but I forgot, another thing I have been doing all my life, so at last and with my apologies here is the correction. 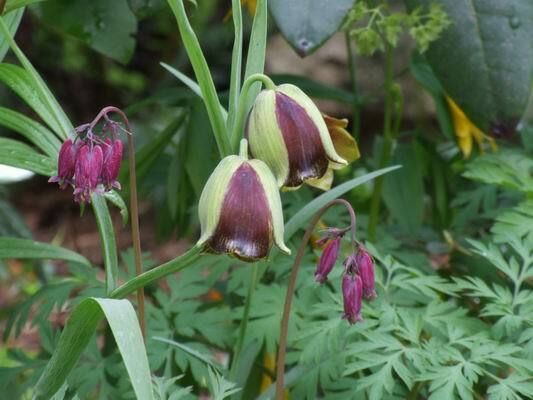 Fritillaria acmopetala is among the latest of the fritillaries to come into flower and it is also perfectly at home growing in the open garden where it slowly increases and self sows. We have several forms showing the variation in both colouration and flower shape that can be found in this species. 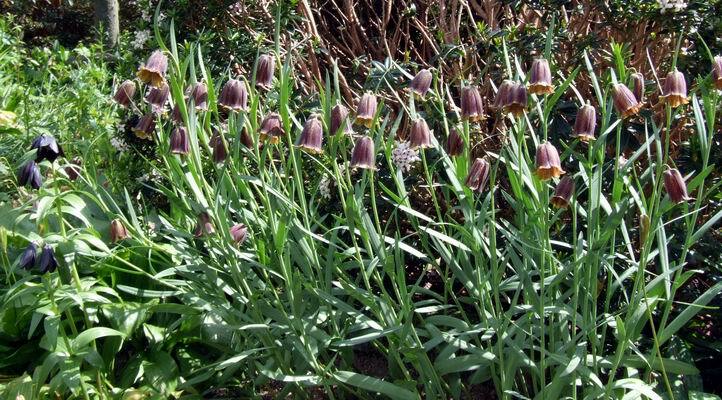 When grown in pots Fritillaria acmopetala produces quantities of rice grain off sets which, if we are not careful, have a tendency to pop up in our other pots of bulbs. This is not a problem that we face alone and I have a theory that, if you grow fritillaries in pots for long enough, no matter what species you start out with, they will eventually all turn into F. acmopetala or hermonis amana!! 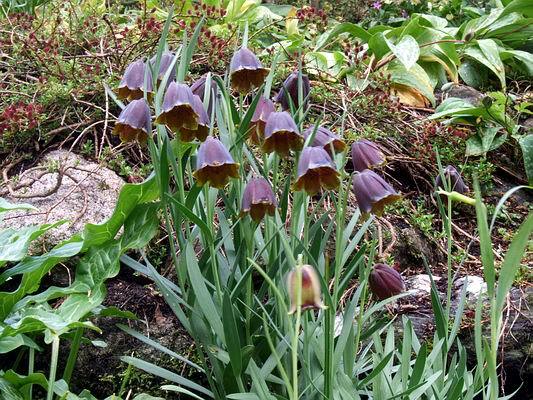 Another variation on Fritillaria acmopetala growing happily in the garden where it increases slowly. I suspect that the bulbs in the garden either do not produce as many rice grains as the same bulb would in a pot, or that because they are left undisturbed and not moved away from the competition of the parent bulb, they do not get the chance to develop. If anything should happen to damage the parent bulb, such as rot, then the rice grains will take over and soon replace the clump. This is an observation I have made over the years and suspect that bulbs in pots produce more rice grains because of the hotter and drier conditions they face than they would if they were planted in our garden. A view across part of the garden shows that the trees are now coming into leaf and the rhododendrons are in full flower. At the bottom of the picture you will see the leaves of erythroniums and fritillarias many which are now finished flowering and will soon disappear under ground until next spring. 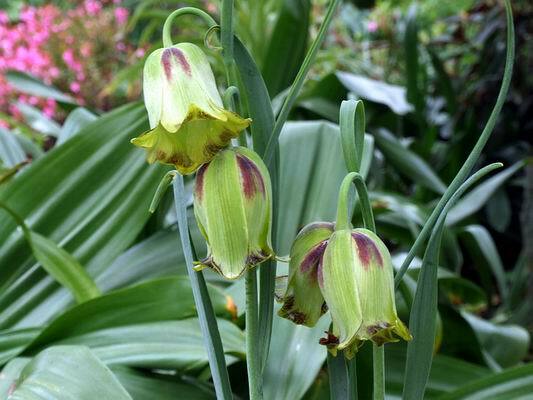 There are a few late flowering frits to keep F. acmopetala company and Fritillaria affinis tristulis is one of those. Fritillaria affinis tristulis is another of those frits that produces masses of rice grains which I have over the years just scattered around the beds and now we have the odd flower appearing every where. They flower on a shorter stem in the garden which is not surprising as they not only get better light levels, not reduced by having to pass through the glass, but the effect of the wind discourages the bulb from extending its stem too much. Fritillaria pyrenaica is another of the fritillaries that extends the flowering period into June, this is our own selected form, 'Braeside'. 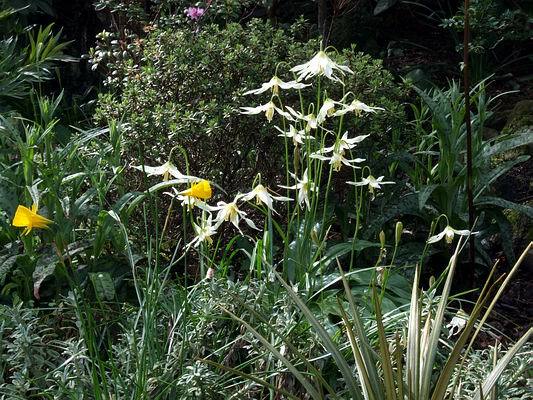 A tall growing selection is Fritillaria pyrenaica twin. It is a good strong form that grows well in the garden having tall stems topped off with a pair of flowers when the bulbs are mature. 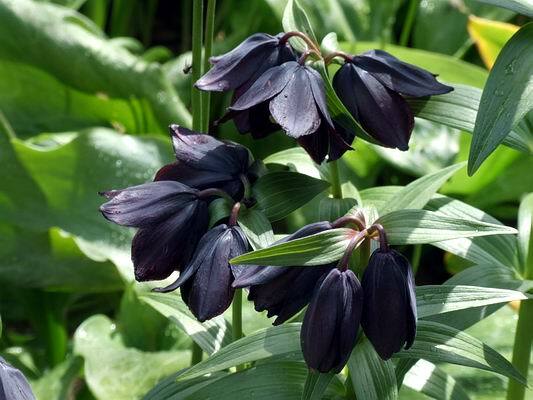 The very black form of Fritillaria camschatensis that we grow is from the Asian side of its distribution. The Alaskan forms, which are not quite out yet, mostly have some degree of green on the outside of the petals as well as narrower leaves - I will show these in the next few logs when the flowers are open. 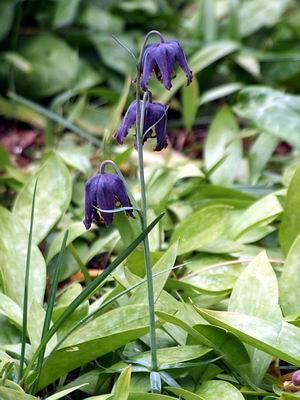 Some of the Chinese fritillarias also flower later, such as Fritillaria hupehensis and cirrhosa. Both of these have been raised from seed and prefer to be grown cool and moist in the garden rather than being confined to a pot under glass. The new roots of cirrhosa are often starting to grow before this season's growth has died back, highlighting the need to keep these bulbs cool and moist through the summer months. With all the erythroniums past flowering except for a few E.montaum I am delighted to have this group of Erythronium oregonum that consistently flowers at this time, extending the flowering period well after all the others of that species have finished. I am growing its seed on separately to see if this late flowering habit will be passed along to its offspring. If it is then I see this as a great plant to use for crossing to try to further extend the all too short flowering season for the most beautiful of bulbs. them in paper envelopes, on the right. The paper absorbs some of the moisture and allows the surplus to pass through so the seeds do not rot but they will dry out more than they would if stored in sand. Ideally I would like to be able to sow all my Narcissus seeds as soon as they are shed, placing them at depth into a dry compost and keeping the pots dry until the first watering in September however I do not have the space to do this with all of them. While the majority of the later flowering fritillarias are very dark coloured the later flowering species of Corydalis all tend to be blue. On the left is Corydalis turtschaninovii which I received originally from Janis Ruksans. It is a plant of woodland edges from parts of eastern Russia and grows well in a compost rich in humus that never dries out. It increases both by division of the bulb and by seed. On the right is C. cashmeriana which enjoys similar cool moist conditions. To keep Corydalis cashmeriana healthy and growing well it requires regular lifting and dividing at least every second year. 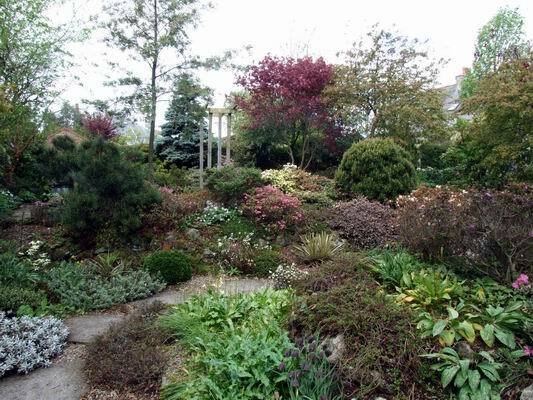 This is best done either just before it starts into growth in early spring or immediately after the foliage dies down in the summer. Corydalis cashmeriana has a similar habit to C. flexuosa in that they both die down in the summer, only to put on a second phase of growth, sending up a new set of leaves when the temperature starts to fall and moisture levels increase again in late August - this growth stays green until the frosts come.